Wayne Rooney’s gesture ahead of kick-off while heading out as Everton captain against his former club on has got fans excited. The England legend led his side out, as Paul Pogba wore the captain’s armband for Manchester United at Goodison Park. While in the tunnel, Rooney looked focused and unfazed by the prospect of facing his former club, where he spent 13 years to become their all-time leading goal-scorer. With several of his former colleagues and friends on the opposite side, the Everton skipper did not find it important to greet everybody, and rather just stay focused. While Frenchman Pogba was shaking hands with Everton players, Rooney barely looked at him and stayed by himself. Fans on social media site Twitter went crazy, and praised Rooney for having his eyes on the game rather than going for any gestures. The versatile forward looked solid till the time he was on the pitch, and he also enjoyed a lot of time on the ball during the first half. In his midfield role, he kept up the tempo, much to the delight of the Toffees. 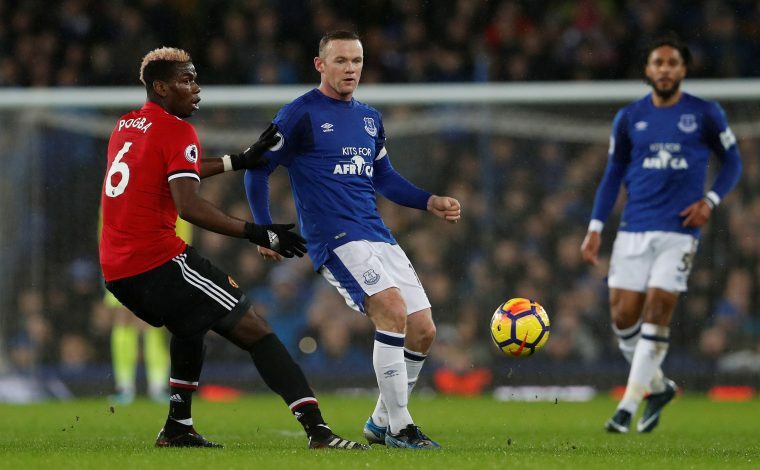 Although in the 2nd half, Rooney’s final act to lose the ball while in possession led to United scoring their opener, but the Everton fans were still far from happy with Sam Allardyce substituting him at the hour-mark. United went on to win the game 2-0, and Pogba was on fire in the 2nd half, as he set up both the goals, whilst also showing the fans a lively spell blended with tricks, and forcing a good save from Jordan Pickford with a well taken shot.